We have lots of ideas for unusual Bridal shower favors for your party. But it is worth considering the whole subject of giving favors. Favors are small inexpensive gifts or presents that are given to guests at a Bridal Shower as a thank you for their attendance and also to serve as a souvenir of the occasion. The key word to remember is that favors should be inexpensive! As a nice souvenir of a lovely event it is also nice to put some time and effort into choosing party favors and perhaps considering making your own unique homemade Bridal shower favors. Cheap party favors are more than acceptable - in this instance it really is the thought that counts! Bridal Shower Favors - Ideas, Hints and Tips! Top Tips for Bridal Shower Favors! Before you make any decisions at all regarding favors decide on a theme for your party. It is a really good idea to follow the theme of the party through to the type of favor you give to your guests. If you are planning some party games then add to the fun and have lots of little favors to give out as gifts or prizes! 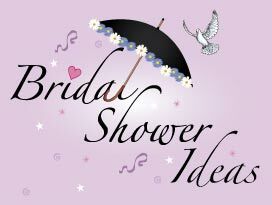 List of Ideas for Bridal Shower Favors! As we have already said favors need not be expensive and handmade or homemade favor is more than acceptable at a party. Ideas for Boxes and Bags! Once you have decided on the type of favor you want to give your guests think about how you can make them look really attractive - we're talking Favor Boxes and Favor Bags. You can buy boxes or bags but you can also make them yourself. We would recommend making your own bags - they're really easy to make! Bags can be made from any type of material including Cellophane, Metallic, Tissue paper, Organza and Felt. Pretty wrapping paper and stickers can also be used to create bags! Then consider ways of decorating favor bags and favor boxes! Add a souvenir note (made with the same theme as your party invitation) - a lovely personal touch and an immediate way to say "Thank You" to your guests! Add some ribbon or rafia and perhaps some glitter! There are many different types of ribbon, in different widths and colors to give you some great ideas! You can buy curling ribbon, satin ribbon, metallic ribbon and organza ribbon! Beautiful! Handmade or Homemade Bridal Shower Favors! In the current economic climate it makes sense to make your own favors - they are cheap and fun to make! You can also ensure that you have fully personalized to suit the bride-to-be. So get creative and make some great homemade favors! Our selection of Bridal Shower Ideas includes our unique printable Bridal shower invitations. Top ideas for Bridal Shower Favors! Fully personalized and homemade Bridal shower invites and thank you cards are not only easy to make and print with the addition of photos but are also cheap to make! Match their theme to your party favors!